Stevenson University to Honor KaBOOM! Founder and CEO Darell Hammond with Social Entrepreneurship Award | KaBOOM! Stevenson University, a private university in Stevenson, MD will award KaBOOM! Founder and CEO Darell Hammond with its inaugural Social Entrepreneurship Award as well as an Honorary Doctor of Humane Letters at its Commencement ceremony today. The Social Entrepreneurship Award honors individuals who achieve high social returns for communities through transformative leadership and innovation. In addition to founding and running a successful non-profit, Hammond is also a New York Times best selling author whose memoir, KaBOOM! : How One Man Built a Movement To Save Play, details his childhood and how he came to found national nonprofit KaBOOM!. Hammond grew up with seven brothers and sisters at the Mooseheart Child City & School, a group home outside of Chicago. The Mooseheart community instilled in Darell the power of volunteerism and the importance of helping those less fortunate get a head start. 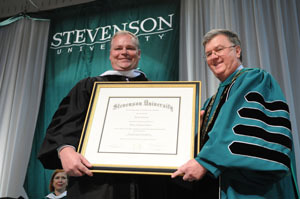 "Darell Hammond exemplifies an individual who has confronted challenges with great courage and personal strength, undaunted by the obstacles that life can put in the way," said Stevenson President Kevin J. Manning, Ph.D. "His story conveys a valuable lesson to our graduates about personal strength, facing problems, finding solutions, and using our talents to serve others." After attending community college and Ripon College, Hammond read an article in the Washington Post about two young children dying after being trapped in an abandoned car while playing because there were no safe places for children to play in the community. Hammond changed that – he built a playground and started KaBOOM!, the DC-based, national non-profit to support building playgrounds in low-income communities across the U.S. Under Hammond’s leadership as CEO, KaBOOM! has raised more than $200 million, rallied a million volunteers, led the hands-on construction of 2,000 playgrounds, and inspired a movement for the child’s right to play. In the early years, Hammond developed the first-rate public-private partnership model that makes the impossible possible with every community-built playground project. During a KaBOOM! playground build, the organization brings together local corporations, community groups, parents, teachers, and kids to design their dream playground. As a result, the community gains a gathering place and playground while it strengthens relationships and becomes more connected. Hammond has won numerous national leadership awards and has been profiled in People, Washingtonian, Fortune, Fast Company and Worth magazines, the Non-Profit Times, the Chronicle of Philanthropy and Crain’s Chicago Business. He has also received the President’s Volunteer Service Award, the Jefferson Award for the Greatest Public Service Benefiting the Disadvantaged, NYU Stern’s Satter Social Entrepreneur of the Year Award and most recently, the American Express NGen Leadership Award from the Independent Sector. In addition to his work with KaBOOM!, Hammond has served on the Board of Directors of Hands on Network, Net Impact, Independent Sector, and CECP Advisory Board. In 2003 he was elected as an Ashoka Fellow for being a leader in social entrepreneurship. Stevenson is the third-largest independent university in Maryland with more than 3,900 students pursuing bachelor’s, master’s, and adult accelerated degrees in the classroom and online. The University is committed to providing a career-focused education and historically has placed 95 percent of its students in jobs or graduate programs upon graduation. The University is awarding degrees to 498 graduates.